I’m fairly generous with this label. There are a lot of best things ever. By simple mathematical standards, this means that there are few things that are not the best ever. Let me tell you, Purdue is at the very top of that short list. In case you didn’t know, roasting chicken is just about my favorite thing to do (it’s the best ever). I love experimenting with different marinades and rubs, watching the skin change color and get all crispy, smelling the flavors throughout the whole house, and putting it on the table. I mean, what’s more badass that being able to cook an entire effing bird? Probably a lot of things. Though, as far as I’m concerned, this is it. A couple of months ago, I decided to roast myself a chicken. I went to the grocery store and saw a plump Perdue bird. Manager’s special! I should have stopped there. I’ll spare you the slimy details, but in so many words, this bird was pumped with more hormones than all the 15 year old girls in the world put together. It was sticky and fat and while the outside got tough and dry, the inside stayed raw and slippery. I threw the whole thing away and went out for Chinese, where, in retrospect, I ate some more questionable chicken. I know it wasn’t my fault, but this experience really took its toll on my self-esteem. I took a long sabbatical from roasting chicken after that and solemnly swear that I will never ever buy another Perdue product. I suggest you do the same. The anniversary of my learning how to roast a whole chicken just passed. Last year at Christmas, I somehow managed to only get gifts encouraging me to learn this new skill. I got a Spanek vertical roaster, thermometer, baster, injector…all the good stuff. This holiday season, with my Purdue experience in mind, it was tough not to think back to last year’s festivities. Lo and behold, my wonderful father knew just the thing to get me out of my funk. He gave me this amazing meat thermometer that tells you when your meat has reached the appropriate temperature. No more arbitrary timing or opening and closing the oven. This was a game-changer. With my new tool, I’ve learned a new trick. Cornish game hens are tiny little chickens and they are the latest “best things ever.” I mean, who doesn’t want to eat a mini chicken? They’re a little more gamey, but mostly more flavorful and juicy. This wet herb rub is the perfect companion for the hens. Because everything is blended together in a food processor, all the flavors meld to create a tangy, spicy, and earthy flavor. The infused butter soaks into the chicken so that every bite has that awesome herb-y taste. What could go wrong? Especially when you have a psychic thermometer that tells you when your food is done. I get it: roasting a whole big bird is kind of intimidating and it’s a lot of food. But you have no excuse not to make a Cornish game hen. It’s easy, delicious, and won’t leave you with more leftovers than you know what to do with. And with that, here’s my rendition of a recipe that’s been floating around the food-blogosphere. 1. Preheat oven to 400o 2. 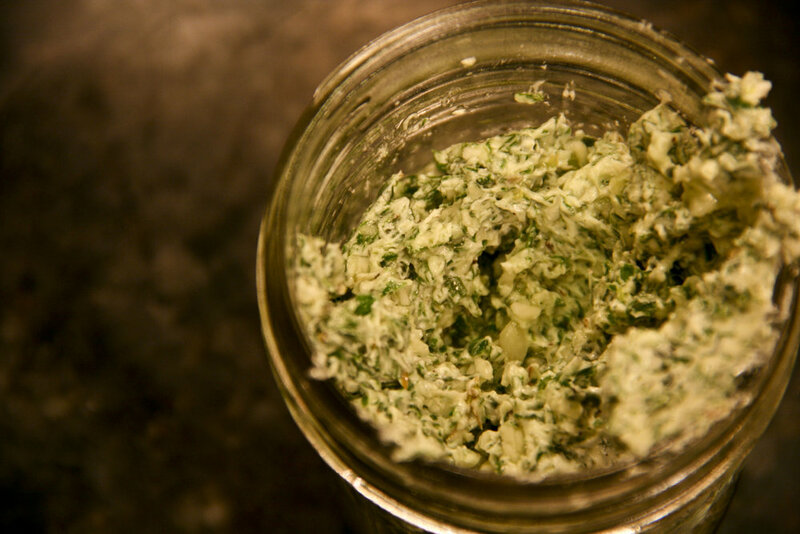 In a food processer, blend rosemary, thyme, parsley, garlic, butter, lemon juice, salt, and pepper until combined. Mixture should be slightly thick with a little residual liquid. 3. Clean hens thoroughly and pat dry. 4. Truss them. (I’m not even going to try to explain this one. Let YouTube do the talking.) 5. Use a spatula or your hands to cover each chicken, front and back, with the wet rub. 6. Bake in a roasting pan for 50 minutes, until a meat thermometer reads 165o. 7. Let rest for five minutes. Use a sharp knife and kitchen sheers to cut in half, along the breast bone, or serve whole.